As I found myself staring at the dismantled frame of what was supposed to exist as the base of our booth display, I couldn’t help but have nostalgic feelings of putting together Ikea furniture and refusing to let it come out victorious…again. From what I’m told, most people who have been a part of hosting a booth at a conference have found themselves in a very similar situation. This was just one of many lessons I learned at my first industry convention last week at the CUPSA/IACLEA Regional Conference for Campus Safety in Atlantic City. I took what was one of the most eventful 24 hours I have experienced in my career and pulled out some tips and tricks I learned along the way in hopes that you can use them to breeze through your next event with a smile on your face and lots of business cards in your pocket. Introduce yourself to a stranger. Chances are they are waiting for someone to talk to as well and can’t keep pretending they are busy on their phone forever. Ask where they came in from, compliment them, what brings them to the event, or anything that simply makes that human connection. Aside from just this conference, I have been to plenty of events where either myself or others fell victim to not bringing enough business cards. These are still a great way to keep track of who you met and how to follow up with them afterwards and vice versa, so make sure you are prepared! 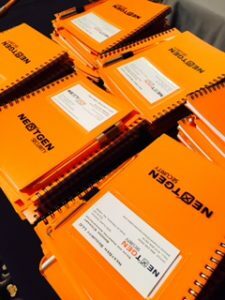 In our scenario, we ordered notebooks that had a slot on the front for our business cards, so not only were we handing out some useful swag, but they got our contact info along with it. When it comes to packing I stick with two rules, pack lightly but be prepared for anything. Bring clothes that can be dressed down or paired with a blazer and a dress shirt. You never know if your group is going to be asked to a last minute dinner with potential clients, or the heat in the meeting room is turned up way too high. Pick items that are interchangeable to keep you from feeling uncomfortable. Get to know people with whom you can form a mutually beneficial relationship. Use this time to get introduced to a contact in your target vertical, or seek out solutions that might fill some current gaps in your security program. On the flip side, always make sure you do a round and check out the other booths, many of which might be your competition. The more you know the better you will do at separating yourself from the pack. DON’T leave your booth unmanned at any point – if you are attending alone then have a dependable customer or vendor partner fill the temporary void. The security industry is small, it seems like everyone knows everyone, so these new relationships will only help positively market your brand. If you can get an attendee list, do so. Or do a little digging through LinkedIn or friends you have in the industry to find any contact info on who will be there. Shoot these people an email inviting them to stop by your booth, or set up dinner/drinks with someone you have been trying to form a relationship with. The greatest lesson I gained is that everyone truly is there to both gain and impart knowledge, and is more than willing to help each other out. The friendliness I found and quick connections I was able to form exceeded my expectations. I always try to learn from every experience, but I can say without a doubt that I am looking forward to my next networking conference.